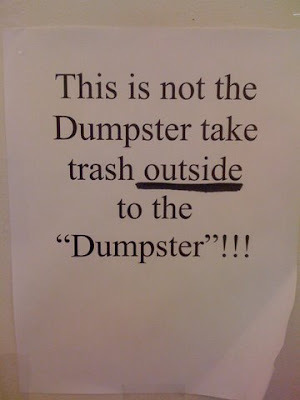 The “Blog” of “Unnecessary” Quotation Marks: the "dumpster"
They call it the "dumpster" but it's really a drained swimming pool they've taken to tossing all their garbage in. I'd like to give them the benefit of the doubt and suggest that "Dumpster" refers to a recycling bin that everybody knows is just a disguised trash receptacle. Due to the run-on sentence, though, I think I won't. Well, when capitalized, it's a brand name like "Kleenex". But that's no excuse for the run-on sentence. Maybe there is a 'down-on-his-luck' dude out there waiting to pick over your "offerings" He's like a sort of mascot that they 'look after' this way. hey "Dumpster" you the man! Not just Dumpster, of course, but the Dumpster. Sort of like the Dude in "The Big Lebowski". This sign has more problems than the quotation marks. That's what I love about a lot of these. The quotation marks are horrible, but there is also a lack of NECESSARY punctuation.